Well, now that I've gotten the new blog up and running, there I go and take an unannounced five-day break to begin the year! Well, I'm back, and for real, so never fear...there's lots more to come. 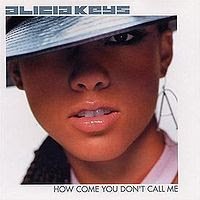 To start with, how about some old-school Alicia Keys in a song that relates to how you might have been feeling the past few days? Trivia: This song originally began as "How Come U Don't Call Me Anymore?" written and performed by Prince and appearing as the B-side to the far more famous "1999." Keys' version was released as the third U.S. single from her much lauded debut album Songs in A Minor, although it topped out at #59 on the Billboard Hot 100 just before Keys appeared on Eve's single "Gangsta Lovin'," which later joined the #2 Club of songs that peaked at the penultimate slot on the singles chart. Get Alicia Keys' fantastic debut album, still (in my humble opinion) the best of her career.